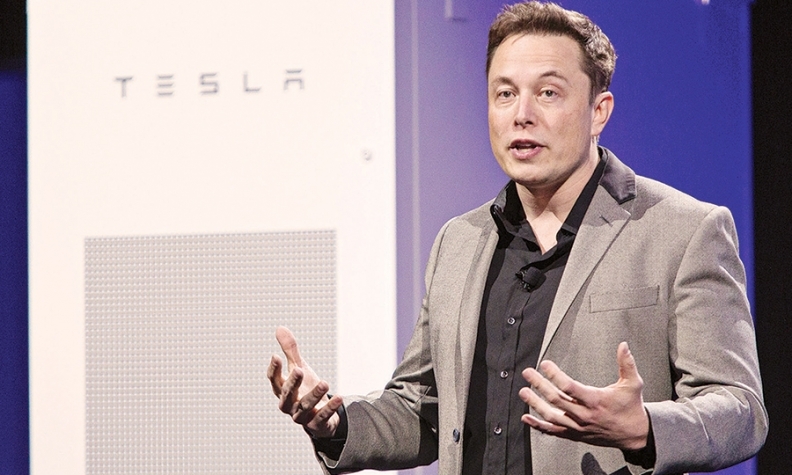 Tesla Motors CEO Elon Musk speaks during the unveiling of the company's Powerwall batteries. SAN FRANCISCO -- Tesla Motors Inc. is a car company, but perhaps not for long. A yearlong backlog of orders for the home and commercial batteries unveiled in April under the Tesla Energy brand has persuaded Tesla to consider a further expansion of the $5 billion "gigafactory" that the company is building in the Nevada desert. Speaking to investment analysts last week, CEO Elon Musk said stationary batteries like the Powerwall and Powerpack, used to store energy from solar panels, may someday require twice as many battery cells as Tesla's cars do. If the battery business pans out, that would leave Tesla in a rare position among automakers, deriving most of its business from homes, factories and offices, rather than car sales. "The sheer volume of demand here is just staggering," Musk said. Tesla had planned to devote 30 percent of the Nevada factory's battery production to stationary batteries, he added, but "we could easily have the entire gigafactory just do stationary storage." Since unveiling its batteries on April 30, Tesla has gotten 38,000 orders for residential Powerwall batteries and 2,500 reservations for commercial Powerpack batteries -- as many as Tesla will be able to produce through mid-2016. "We need to make cars, too," Musk said, "so we're trying to make the factory bigger." Musk's comments came after Tesla reported that its net losses tripled to $154 million in the first quarter of 2015. The company's stock price held steady, signaling that the news didn't spook investors, but it prompted warnings from analysts. Tesla's cash burn for the quarter was "eye watering," Morgan Stanley analyst Adam Jonas, who is usually bullish on Tesla, wrote in a note last week. He said it raised the stakes for a well-executed launch of the Model X crossover later this year. Tesla plans to start making the Powerwall and Powerpack this year at the assembly plant in Fremont, Calif., that builds the Model S sedan. Production of the Powerwall and Powerpack would move to the Nevada factory after it opens in 2016. Despite the demand for power-storage batteries, Musk said Tesla will not divert lithium ion batteries away from its cars. "I guess we'd pick cars," Musk said, answering a question during the earnings call. "We've got this whole other plant in Fremont making cars, so cars will get the priority. That would be a logical priority. But I mean, it really feels like, man, the stationary-storage demand is just nutty. Worldwide, it's just crazy."